Getting your outdoors spring-ready consists of many tasks and chores intended to make the home a safer, more accessible place to be. For example, one early step to preparing for spring is to clear away trash and clutter that could present health and fall risks; another is to adapt current living situations with mobility aids, like ramps and lifts. Depending on your distinct needs, challenges, and home environment, there are many ways to augment and improve your home’s exteriors. Spring is the perfect time to freshen up the outside and exteriors of your home while giving your curb appeal a maintained appearance. In doing so, you may identify a need for equipment to help with accessibility such as mobility aids; assess the property for potential changes, modifications, and augments that could improve your ability to get around your living environment, while also preserving as much of your autonomy as possible. Not all spring chores evolve around painting the house or planting a garden; some may simply be things like trips to the waste transfer station or fixing a shoddy step. Take an honest evaluation of how you navigate and traverse your property to determine if – or when- adaptive aids or assistance might be merited. Clear away any clutter, debris, or trash outside near and around your property. Haul this off to the waste station or call your town office about curbside pickup in your area. These items can cause fall risks and can impact the safety of your property. Don’t compromise your health with a nasty- but preventable- fall over stuff that you don’t need or want anyway. While you are clearing the property of clutter, remove inherent hazards, like full gutters, loose limbs, potholes, or heaves in the landscape that could present fall risk to you or those you love. If you are unsure about what constitutes a danger, contact a local building inspector or general contractor for a home inspection. Some area agencies on aging also offer services that can uncover and resolve any problems before they become dangerous. Arrange to make repairs as needed, such as replacing shingles, fixing stairs, resurfacing patios, leveling concrete, or whatever other spring tasks emerge after the long winter. Again, it makes sense to take advantage of local programs geared toward preserving the independence and safety of seniors in the community. Mulch is an amazing material that can do so much to your exteriors. First, it helps reduce the need to water plants as it helps them retain and absorb moisture. Second, mulch helps to cut down on both weeds, by blocking sunlight to the soil, and pests, like mosquitoes. Also, a thick layer of rich, wood mulch improves curb appeal and gives your yard, gardens, and beds a neat and tidy border. Redefine the paths that traverse your property. Make sure that stepping stones, brick, or cobblestone is secure and up to par. If you need to, order aggregate gravel for surfacing driveways or paths. It is easy on the feet when walking and cuts down on the dust that finds its way inside your home. 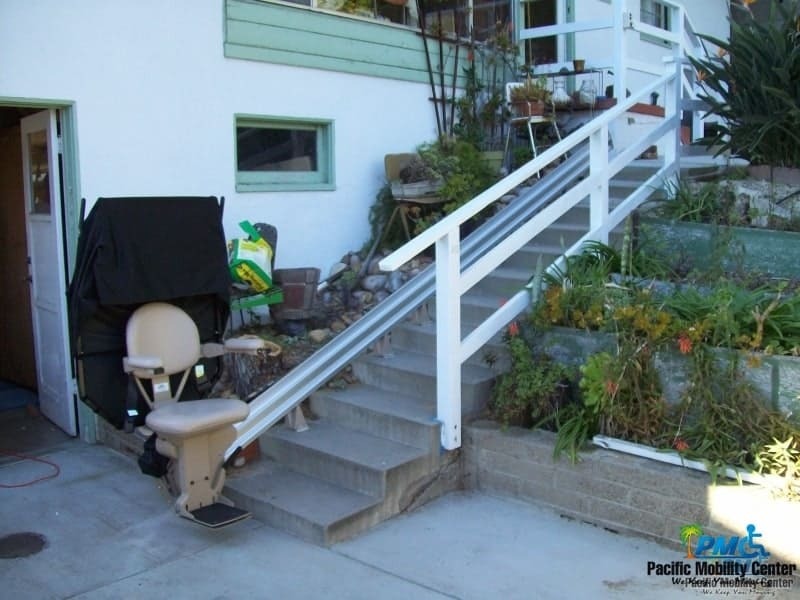 Is it time to adapt stairs outside your home with lifts or ramps? Make the entrances and outdoor features of your home more accessible with these mobility aids. Talk to a qualified mobility retailer to learn more and explore your options. There comes a time when it simply is practical and cost-effective to invest in professional landscape design and maintenance services. This ensures the curb appeal of the property isn’t compromised due to an inability to properly maintain, mow, garden, or trim the greenspaces. Also, it provides yet another support and engagement for the senior or individual residing there, who is also paying attention to potential hazards and risky situations for their client, which helps to create a network of support. When it is time to make the home more accessible and those living there more autonomous, invest in outdoor lifts, for the pool or porch, to regain access all around the property. These are life-changing for individuals needing this level of assistance, yet they also allow those who do not need such aids to living untethered. Talk to a mobility dealer to learn more. Don’t be afraid to reach out for assistance in getting your home or property ready for spring. If you lack the physical ability to take care of your exteriors, talk with your local municipality or area agency on aging to find resources that may help or eliminate this task for you. Volunteers, grant money, or programs may be available to help you spring into spring! Want to learn more about getting the home ready for spring? Ready to make your living situation more accessible with adaptive aids and mobility devices? Come talk to the professionals at Pacific Mobility; they are ready to assess your needs and help uncover the most practical solutions for you.